Many species of beetles infest wood in southern California. Wood boring beetles are decomposition agents which attack trees, timber, furniture or structures. Beetles go through a complete life cycle - egg, larva, pupa, adult. Wood boring beetles are known to do the most damage in the larval stage. Pupation typically takes place in the wood and as adults emerge from the wood, they leave holes in the surface. There are many methods of control for wood boring beetles and our service technician evaluate your infestation and discuss options for effective control. 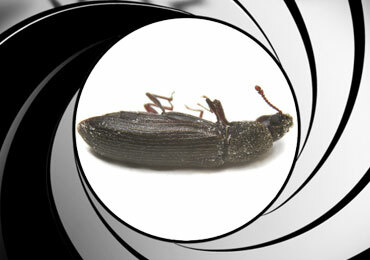 License to Kill provides comprehensive residential pest control protection plans. We specialize in wood boring beetle pest control. We have extensive experience eliminating wood boring beetles in historical structures, apartment complexes and commercial properties. At License-To-Kill, we understand pesticide sensitivity. If you’re allergic to pesticides, concerned about your pregnancy pets or children, we care and are prepared to work with you. Please call us for your pest control needs today. License-To-Kill offers three treatment programs based on your wood boring pest infestation level. License-To-Kill’s service technician will inspect the property for signs of boring pest damage. Infested wood will be locally treated by your technician. Cosmetic damage will be repaired by our in-house construction team. License-To-Kill offers total elimination of wood boring pests through structural fumigation. License-To-Kill will tent fumigate the entire home or apartment building for wood boring pests. Immediately after fumigation, we apply a chemical barrier to ensure wood boring pests don’t re-enter the home. Cosmetic and structural damage will be repaired by our in-house construction team. Get Rid Of Your Wood Boring Beetles Today!